Memphis is known as a commuter town, but amidst the traffic and expansive parking lots, some people have opted for a car-free lifestyle. The choice may be grounded in economics or recreation, but the result is the same--people find themselves becoming more engaged in their community. In a city where it seems that everyone feels they must have their own mode of personal transportation, there are actually quite a few souls who have chosen to go car-free. Some choose public transportation, others opt to bike. Terre Gorham is a laid-back transplant from Kansas City, Missouri, who has opted to downsize her life here in Memphis. She deliberately chose to live downtown because she could live car-free. The urban environment offered a plethora of conveniences in a very walkable area. Plus, her condominium is right on the trolley line. She has lived without a car for 13 years. As a freelancer, often she is able to work from home. And with the advent of telecommuting, she chooses to accept jobs that are either within walking distance of her home or that are only a short trolley or bus ride away. "I can hop on the trolley if I need 'wheels,' and I don't have the expense of a car or its upkeep. No insurance, gas, tags or wheel taxes, and parking isn't an issue. Bottom line, not owning a car makes for a less expensive lifestyle. It also offers exercise and a chance to meet people and truly experience my neighborhood. It is a greener choice that fits in with my quest for a simpler lifestyle," Gorham explains. 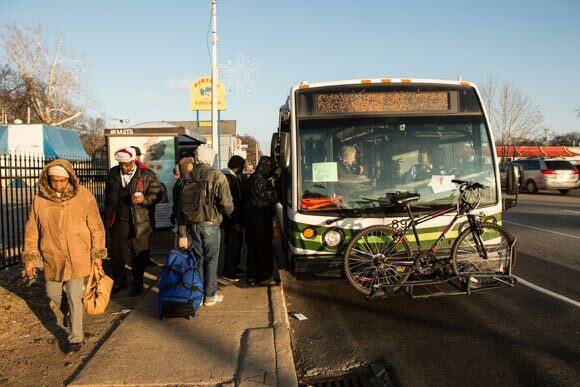 To make a trek farther from home, like to go to the Southwind area for a doctor's appointment (typically a 25-30 mile trip, one way), Gorham relies on public transportation options like MATA buses, taxis or ride-sharing companies like Lyft or Uber. She also has the option to rent a Zipcar, which are actually parked outside of her condo, but said if the other public transportation options don't work out, she usually just catches a ride with a friend. "About 99.9 percent of my lifestyle needs (i.e., groceries, sundries, clothes, etc.) can be met within my downtown neighborhood, or I make purchases online and have items shipped directly to me." But going without a car is not without its challenges. Whether on a bus or a bike, weather can make getting around difficult. And there are inherent hazards for cyclists on Memphis streets. Drivers don't always look out for those on two wheels. Additionally, riders need to stay alert to the possibility of crime and being targeted on the street. With fun and recreation as their top priority, Vollintine Evergreen residents Michael and Nancy McMullan prefer to hop on their bikes rather than hop in their cars. Yes, they do own two cars. However, for years Michael usually rode his bike to work. And now that the couple is retired, they only use a car when circumstances dictate (like picking someone up at the airport or needing to haul something that could not be transported on their bikes). Parking their cars and using their bikes also provides the exercise they seek to maintain a healthy lifestyle. "It has become a lifestyle of choice," says Michael. "Fun is first and foremost, exercise is second and transportation is third in our reasons to bike versus drive [a car]. We are able to run errands and take care of our needs while taking care of our recreation, like biking to the Memphis Farmers Market. Then we get exercise and groceries. Plus, we'll stop by the post office while we are out for a ride, or bike to meet friends for a meal and social time. It's just easier to meet and visit with your neighbors from a bike versus a car." The McMullans enjoy biking so much that they often choose their vacation destinations based on places that are bike friendly. "We have packed our bikes on our car for trips to New Orleans, Minneapolis, Chicago, Little Rock, Austin, Chattanooga, Tallahassee, St. Louis and Washington, D.C. Once we get to our destination, we park our car and hop on our bikes," adds Nancy. "And if we don't take our bikes with us, we seek out loaner bikes." Whether at home in Memphis or traveling, the McMullans agree that they get to experience a city in a different way on a bike, saying that it affords a different perspective of neighborhoods and how a city is put together. "You see things in more detail when you are not insulated in a car," says Michael. "And I think it does the world some good from a sustainability standpoint. We're real excited about the Harahan Bridge project and the other Greenline expansions that will help make Memphis a more bike commuter-friendly city." T.J. Elliott, self-professed "bike nerd" and sales associate at The Peddler Bike Shop on Walker Avenue in the University District, said that the cyclist movement is gaining momentum for a myriad of reasons, some recreational but mostly economic. "It is much less expensive to buy or build a bike and maintain it than it is to purchase and pay for the upkeep on a car. Box Bikes and Buggy Bikes, based on designs by the Amish and the Mennonites, give cyclists the ability to carry bigger loads, even four to five children. In other areas of the country, parents are forming group cycling shifts to transport their children to school," says Elliott. Local bike retailers The Peddler, Victory Bicycle Studio and Midtown Bikes can do repairs for these types of bikes and also offer cargo bikes and bike accessories, such as trailers, that increase a cyclist's hauling capacity. East Memphian Paul Patrick has found a novel solution to his car-free quest. Although he still owns a car, he got a solar-powered bike/car, called an ELF (Electric Light Fun), last spring that is legally classified as a bike; therefore it does not require tags, a license or insurance--or gas. Patrick was one of the first 350 people worldwide, and the first person in Memphis, to own an ELF. 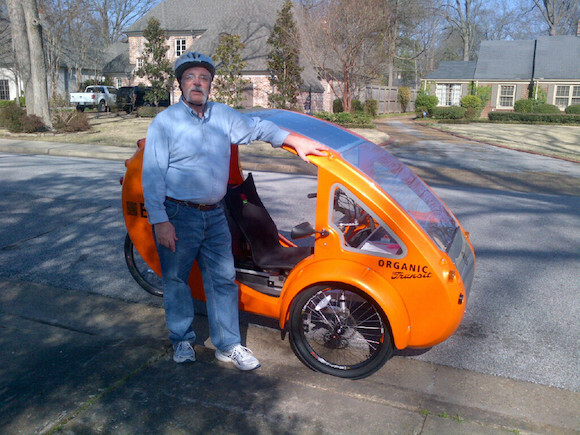 Since Patrick purchased his ELF from the North Carolina company, Organic Transit, it has begun manufacturing a two-seater version. The three-wheeled apparatus comes complete with a roof, front and back windshields and a cargo cabinet. It also has a solar panel that charges the battery of an electric motor. Usually the bike is foot powered in the usual way of peddling, but the electric motor is available for an assist that can boost Patrick's speed up to 20 miles per hour. This bike is considered to be a complete car replacement. Patrick treats it as a seasonal ride, the main mode of transportation for his 29-mile round-trip trek to and from work, using it primarily during the daylight savings time months. But for safety purposes he opts for a car when darkness falls. Midtowner Miles Tamboli, currently a resident of East End who is soon to move to the Binghampton area, chose to become car-free last April to "better regulate [his] lifestyle." He says he enjoys being in touch with the real city itself, feels less stressed and really enjoys being outdoors instead of cooped up in a car. Tamboli says, "I live completely carless, and live a perfectly normal life. Memphis has really advanced in its bikeability over the past few years, and it's becoming totally commonplace to give up the automobile and hit the road on two wheels. Thanks to the Greenprint plan, we can look forward to being one of the country's most bike-friendly cities in just a few years, which is really a dramatic shift and a sign of Memphis' progressive revitalization."